This continues from a previous post which argued that there is a contradiction between Jesus being descended from David and Jesus being born of a virgin. A person can only have one father and so Jesus was either sired by God or Joseph. The idea that descent could be through Mary or that Jesus was adopted by Joseph were also considered and found wanting. Neither claim is made in the Bible, so it looks like what it probably is: a latter attempt to paper over the cracks. The previous post also considered whether Jesus could be the son of David (ignoring the virgin birth aspect) but found the evidence unconvincing. It again looks like what it probably is: Christians after Jesus gradually evolved a number of stories supporting the idea that he was the son of David in the absence of any supporting evidence. It is supposition gradually solidified in the re-telling. This also explains why the genealogies contradict each other and why the virgin birth stories co-exist with the son of David stories. I commented that this effectively removes Jesus from being a viable candidate for the Messiah. The Messiah must be descended from David. The virgin birth is optional to some extent since the Old Testament never links the virgin birth to the Messiah. Of course, if it is not historical then we have to wonder why Matthew and Luke included the story at all and what other parts of their narrative are not historical either. In this post, I want to look more closely at the idea of the virgin birth and the related idea of Jesus being born in Bethlehem. I say that these are related because Matthew and Luke are the only places in the Bible that relate the virgin birth stories and these are also the only link to Bethlehem. From the perspective of Jesus being the Messiah, the Bethlehem link is more important, but it turns out that neither the location nor the method of Jesus’s birth is convincing, with the conclusion again being that Jesus cannot be the Messiah. I will first look in detail at the Bethlehem connection and then at the virgin birth. 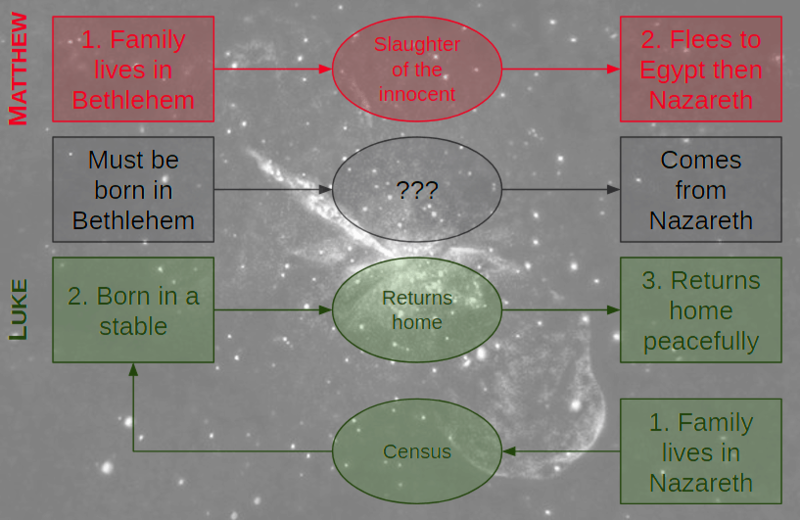 So let us look in more detail at the Bethlehem connection. I will consider Micah, Matthew, Luke, and other references (or lack thereof). whose goings out are from of old, from ancient times. Assyria? The Assyrian empire collapsed 600 years before Jesus of Nazareth. So that is not a convincing prophecy of Jesus. And who are the seven shepherds and eight leaders of men? A skeptic might ask how this possibly relates to the events of Jesus’s life. I suspect the apologist’s explanations will smack of sophistry. Probably the best attempt is to say that all this is referring to Jesus’s second coming. This is an easy way to ignore any data that does not tie in with the first one. But hang on, this is the link to the birth in Bethlehem. So is Jesus going to be born in Bethlehem when he comes a second time too? And should we be looking out for the rise of Assyria? No, that’s a metaphor for the, er, Romans? Americans? Chinese? Or was it, perhaps, the people of the time writing what they thought and turning out to be wrong. So it is clear that the Messiah was expected to come out of Bethlehem, the city of David. With this motivation, it is easy to imagine early Christians evolving a story in which Jesus of Nazareth comes to be born in Bethlehem. It seems that at least two stories evolved: Matthew has the family living in Bethlehem and then moving to Nazareth after fleeing from the slaughter of the innocent to Egypt, while Luke has the family living in Nazareth and popping down to Bethlehem because of a census. I emphasize again that this does not need to be maliciously invented. It starts as speculation and a listener firms it up a little before passing it on. By the time the gospel writers come to write it down, it has become gospel! I will now briefly go through the separate accounts of Matthew and Luke. They move to Nazareth (Luke 2:39 & Matthew 2:23). Herod slaughters the innocent in Bethlehem (Matthew 2:16). You will note how this story is completely divided between the two gospels with no overlap apart from the birth being in Bethlehem and the family ending up in Nazareth. Skeptically, we know that Jesus is Jesus of Nazareth and we know that, despite this, he was meant to come from Bethlehem so it is unsurprising that the two gospels agree on these two points. It is surprising, though, that they agree on nothing else. If early Jews were told that the Messiah was Jesus of Nazareth they might be expected to inquire about those three question marks. So Matthew introduces the slaughter of the innocent as the driving force. And Luke introduces the census. But could this just be two different people telling the same story? Points 1.2 and 1.3 above are sometimes adduced to suggest that Luke is relating Mary’s account and Matthew is relating Joseph’s (though scholars doubt this). Again, no. The stories are difficult to harmonize when looked at closely and individually, neither one is credible. Nazareth prophecy Given as the reason for choosing Nazareth Prophecy not mentioned (anywhere apart from Matthew). Nazareth/Nazarene do not appear in the OT. List of major contradictions between the Bethlehem accounts of Matthew and Luke. You will see the key indicators that this is speculative: “could easily have”, “would appear”, “would have”, etc. All kinds of additions are made and accepted, but these are driven by theological considerations, not historical ones. The other problem with this approach is that it does not solve the majority of the contradictions listed in the table above. In Matthew, Mary is taken home by Joseph and has a baby which is where the wise men visit. There is no hint that Bethlehem was not their hometown. The first we hear of Nazareth is after they leave Egypt. Matthew comments that this happens to fulfill a prophecy (Matthew 2:23), even though the words “Nazareth” and “Nazarene” do not appear in the Old Testament. Contrast this with Luke 2:39 where Luke says that they returned to their own town of Nazareth. The purification of the ceremonially unclean woman 33 days after the birth (Leviticus 12:4). If Matthew had not written his gospel, Christians would probably not dispute that the holy family had left for Jerusalem within a month or two of the birth. So, again, we have contrived speculation that is required by theology, rather than history. We are in the position where the apologist’s position would be improved if Matthew or Luke had not mentioned the Bethlehem connection at all! If throwing away half your evidence improves your position, you should probably be a little worried about its veracity. Sadly, however, even this drastic step would not fix the situation. 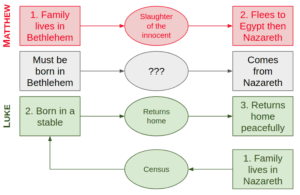 Allow me to zoom in on the two central connecting pieces, namely Matthew’s slaughter of the innocent and Luke’s census. Herod was an unpleasant person and his various atrocities were recorded by historians of the time, especially Josephus. None of them mentions this alleged incident. No other document mentions it. There is no archaeological evidence for it (despite occasional claims). No other book of the Bible mentions it. It contrasts starkly with Luke’s peaceful account. It is an incident suspiciously similar to the Pharaoh’s actions at the time of Moses’s birth (Exodus 1:22). Scholars attribute this to Matthew’s desire to show that Jesus is the new Moses, that is the new law-giver. A star rises in the east and the wise men from the east decide to travel… er… west. We are presumably meant to imagine that this was an astrological sign, and the wise men took it to mean that Israel would have a new king. As such, they head to Jerusalem and talk to King Herod. Herod asks his chief priests and scribes and they point him to Bethlehem. Herod sends the wise men to Bethlehem to search for the boy, asking that they tell him where he is. They go to Bethlehem and are assisted by the star which now moves before them (to the South). The star then comes and stops right over the house. They go in and worship Jesus. As they are about to leave, they have a dream that they should not return to Herod and so they go back another way. Herod becomes exceedingly angry about the way the wise men have tricked him and decides to kill all the male children in Bethlehem and the surrounding countryside. The people wail in accordance with the prophecy of Jeremiah. God puts a star in the sky and leads some wise men to Israel (though there is no record of this astrological event anywhere else despite some claims). He presumably knows that the wise men will head to Jerusalem and tip off Herod. Herod has no idea that this is happening (his scribes have not managed to decipher the astrology) so the only way he knows is that God specifically told him through the wise men from the east. Herod, feeling threatened and knowing that the baby is in Bethlehem decides to wait until the wise men get back and give him an exact address. Herod is the one who figures out that the baby is in Bethlehem, a small town where any out-of-the-ordinary events could easily be discovered by the myriad servants he has at his disposal, but no, he is going to wait for a report from these foreigners. The wise men, despite now knowing that the baby will be in Bethlehem, do not need to ask for directions. A star comes and leads them. No-one else notices this, even when the star hovers over the baby’s house. Now God realizes that He has let slip that His son has been born in Bethlehem. So He sends a dream to the wise men and tells them not to go back to Herod. But hang on! Herod only knew because the wise men tell him. Why didn’t God send the dream a little earlier and tell the wise men to avoid Jerusalem altogether? Why didn’t the star do the leading trick down to Bethlehem in the first place? Now do not get me wrong. Any amount of killing would be awful. But here Matthew says that this leads to weeping in fulfillment of a prophecy (Jeremiah 31:15). The prophecy refers to weeping in Ramah. The problem is that Ramah is north of Jerusalem, while Bethlehem is south. The holy family flees to Egypt, ostentatiously fulfilling yet another supposed prophecy. Hosea 11:1 is not a prophecy at all. It says “When Israel was a child, I loved him, And out of Egypt called my son.” The “son” is not a reference to the Messiah but a reference to Israel and the exodus. No-one else in the Bible knows of the Egyptian detour, not even Luke who is writing of the same event. So God sent the star which warned Herod because He did not decide until later to redirect the wise men? And this led to the slaughter of the innocent. Forgive me if I am skeptical and do not consider this to be serious evidence with its fable-like qualities. But if it is historical, then this is yet more innocent blood on God’s hands. It never happened. Quirinius was long dead by the time Jesus was born. And the notion that a Roman census would require Jewish people to go to the town of their ancient Jewish ancestry is ludicrous. Romans counted people where they lived. It specifically says (Luke 2:4) that they went to Bethlehem because Joseph “belonged to the house and line of David” someone who had lived 1000 years ago. So Matthew and Luke tell us that Jesus of Nazareth was born in Bethlehem. The stories are bogus and incompatible. They do not leave me persuaded that there is any historicity to the Bethlehem connection. These stories arose theologically. What of other New Testament references to Bethlehem? There is only one more. Mark never mentions it. Paul never mentions it. None of the epistles mention it. And the gospel of John mentions it only once. All this leaves me unconvinced that Jesus was born in Bethlehem. The stories evolved because of the theological pressure to do so, not because of any historical research, and their fable-like quality suggests that there is no historical kernel to the story. The word “virgin” is applied to Mary only in the Matthew and Luke birth accounts. Paul does not mention it and the other gospel writers do not mention it. In fact, Paul says that he was born “according to the flesh” (Romans 1:3). Given that these accounts are not even credible on the basic geographical detail we can hardly expect them to be credible on the miraculous details. The historicity of miracles is incredibly hard to support (perhaps even impossible), but if you have to suspend disbelief do so for someone who can at least get the basic facts right! But once again, digging deeper reveals further issues with the story. It is well known that the word translated “virgin” is “young woman” in the original Hebrew and only becomes virgin in the Greek translation (Septuagint) that Matthew was (ab)using. Matthew is often a little lose with his prophecies. We saw above the reference to Ramah instead of Bethlehem in Jeremiah 31; the switch of Israel to Jesus in Hosea 11:1 to get the family to Egypt; and the ripping of Micah out of a context involving the extinct Assyrians. Here the context is ignored just as egregiously. Firstly, Jesus is never referred to as Immanuel anywhere in the Bible. A small point, which Christians will respond to by saying that Immanuel means “God is with us.” Which is wonderful, but irrelevant, since that is never his name. Secondly, the context of Isaiah 7 and 8 is significant since the prophecy is fulfilled in chapter 8. Here’s a synopsis of the story. You will recall that Israel had been split into the Kingdom of Judah (which contained Jerusalem) in the south and the Kingdom of Israel in the north. Ahaz was the king of Judah and was defending Jerusalem against King Pekah of Israel and King Rezin of Aram who could not overthrow it (Isaiah 7:1). Then the tribe of Ephraim decided to join itself with Pekah and Resin, and so Ahaz was afraid because all three were going to destroy Judah (7:2). So God sent Isaiah to meet Ahaz and told him not to worry about it (7:7). God (presumably through Isaiah) then told Ahaz to ask for a sign but Ahaz refused, saying that he did not want to put the Lord to the test (7:12). Isaiah got irritated with Ahaz and told him that God would give him a sign anyway. The sign would be that a young woman will conceive and give birth to a son, and will call him Immanuel (7:14). Before this boy grows up too much (before he “knows enough to reject the wrong and choose the right”), Kings Pekah and Rezin will be laid waste by the king of Assyria. Isaiah then calls in Uriah and Zechariah to watch and makes love to a prophetess (8:2-3) who gives birth to a son. The son gets named Maher-Shalal-Mash-Baz which means quick to the plunder. God tells Isaiah that before the boy can even say “My father” or “My mother”, Assyria is going to plunder the enemy kings. So this is the son who was born as a sign. It is irrelevant whether the prophetess was a virgin before this or not. Clearly, the child was conceived in the usual way. Or, actually, in an unusually cultish sort of way. And Isaiah makes it very plain in 8:18 that the child is the sign that the Assyrians are going to defeat the Kings that Ahaz fears. None of this is linked to the Messiah. Luke does not mention this supposed prophecy. For him, the virgin birth is a device to enable Jesus to be the Son of God (Luke 1:35). But suppose something like this had happened. How would Jesus have been received by his hometown and family? So the “among his own relatives” is taken out by Matthew in an attempt to harmonize with the wonders that his family had supposedly seen. It is always nice to find these little examples of micro-evolution, where small changes are driven by theological necessity. Apologists are no less immune to this tendency today. We are witnessing, in these contradictions, the evolution of a religion. The contradictions have not been smoothed out completely. Mystical symbols are everywhere, imbuing even ordinary events with divine significance and often stretching credulity to do so. Put me down as unconvinced. ← Notes from a Dialog: son of David?